"I'm coming! Keep polishing your stomach till I arrive." When a 21-year-old Buster Keaton met Roscoe "Fatty" Arbuckle in 1917, he was already a veteran of the slapstick vaudeville stage for more than fifteen years. But when he was asked to join Arbuckle in making two-reel comedies, he was immediately fascinated by the possibilities of film comedy. Initially a bit player in Arbuckle's comedies, Keaton quickly became a writer and an equal partner in comedy, until he went out on his own in 1920. This set collects all but one of the surviving Arbuckle-Keaton films. Much of this same ground has already been mined by Kino's set Arbuckle & Keaton. For synopses of ten of the shorts included here, you can visit the reviews of Volume One and Volume Two of that set. His Wedding Night (1917), the third Arbuckle-Keaton collaboration, finds Fatty running a soda fountain under highly suspect sanitary circumstances. When he proposes to sweetheart Alice Mann, daughter of the pharmacist, rival Al St. John concocts a plan, as usual, to swipe the woman for himself. Buster doesn't appear until the second reel, as the delivery boy for the wedding dress. When he models the dress for Alice, Al gets confused and abducts Buster instead. There's an entertaining running gag with an atomizer of perfume in the store, which briefly gets replaced by chloroform, allowing Arbuckle to get a bit outrageous in his lasciviousness. This is a welcome rediscovery and a fine addition to the canon. Previously available on the Slapstick Encyclopedia set, but here presented from a superior print is Oh! Doctor (1917). Roscoe is Dr. Fatty, who has a weakness for the ponies and loses everything on a horse called Lightning. Desperate to save his home, he starts staging accidents to pass out his business card. Meanwhile, Al St. John is swiping Mrs. Holepoke's jewelry and is pursued by his son Buster (Keaton, in short pants). This is a very different Arbuckle-Keaton collaboration and well worthwhile. Although Arbuckle's slapstick is often crude, it's nonetheless quite genuinely funny. His round baby face makes him seem completely innocent even when he's drugging and surreptitiously kissing young women. We also see his work becoming less Keystone-like and more subtle, which has generally been attributed to the influence of Keaton. That's rather clear here, for the shorts are thoughtfully presented in chronological order in this collection (which was not the case with the Kino set). One can see the collaborative process at work. The first 1917 shorts, The Butcher Boy, The Rough House, and His Wedding Night feature Buster in what amounts to a walk-on part. From Oh! Doctor and Coney Island (both late 1917), Buster's role is increasingly larger and more prominent. By the time of Out West and The Bell Boy (1918) , Keaton is a featured player and quite the equal of Arbuckle. In particular, many of the best gags in Out West feature trains (a Keaton favorite) and a general deadpan reaction to death and mayhem in the Old West that simply must have come from Keaton. The remaining shorts are Moonshine, Good Night, Nurse (1918), Back Stage, The Hayseed (both 1919) and The Garage (1920). It's also interesting to watch the development of Buster's character into the Great Stone Face that was and still is beloved. Already in the first short, he's got the trademark flat porkpie hat, but in several earlier shorts, most prominently Oh! Doctor and Coney Island, he's shamelessly mugging and bawling as would eventually become the trademark Stan Laurel character. But by the time of The Hayseed, he has realized the full-blown Buster character in all respects. As to whether the collection is in fact the "Best" is up to debate. It's generally the most complete, with two of the shorts missing from the Kino set. Several of the films, most notably Out West, feature additional footage not seen in the Kino versions. Picture quality is variable, with the biggest difference being Moonshine, but its fragmentary state here is a mark against it. The set still is not quite complete either; there's one extant Arbuckle-Keaton film, The Cook, which is scheduled to be released by Milestone Films on its own DVD set. A Country Hero (1917) remains lost; A Reckless Romeo, long believed to be a lost Arbuckle-Keaton, has surfaced and it turns out that Keaton's not in it at all. 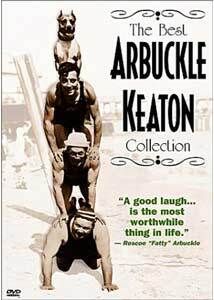 So while it may be the best, it's not quite the last Arbuckle-Keaton disc you'll ever need. Image Transfer Review: As is to be expected, the picture condition is variable. Many of the films here are slightly cropped in comparison to the Kino version, resulting occasionally in gags being lost to overscan on many televisions. The Butcher Boy here is a much more beaten-up print, with highlights blown out and lacking much of the fine detail of the Kino version. Unfortunately, the Kino version has a tendency to jump about, and this offering is a good deal more stable. Out West has its footage presented in a different order, and there's about a minute of additional footage here. The only 35mm material for Moonshine is very fragmentary; that is presented here with intertitles explaining the missing action. Only about a third of that film survives in this form; for the rest you need to have the Kino Volume One, which contains the whole film, albeit in poor condition from a 16mm blowup. At least the best gags are contained in the 35mm fragments here, which are preserved in an Italian archive. Good Night, Nurse is a bit crisper and more detailed in this presentation, as is Back Stage. The Kino version of Back Stage has a little bit more footage at the beginning, which prevents the abrupt start from which this version suffers. The opposite situation holds with The Hayseed; we get more footage at the start on the Image disc. It's also a bit more clear, allowing easy reading of the various sign gags. Finally, The Garage is from a much, much better source than the Kino version, which ranges from acceptable to abysmal in quality. In addition, the Kino disc spoils the opening gag by interrupting it with an intertitle (obviously added after the fact). The other prints appear to be comparable in quality, which is not surprising considering several, such as The Rough House, exist only in a single source print. The bit rate allowed to this set is generally somewhat higher, relieving the occasional compression artifacts and pixelation that were present in the Kino set. Only a few of the shorts (Coney Island and The Garage) are tinted here. Audio Transfer Review: The music scores for the most part sound excellent. In particular, the piano scores by Neil Brand have an excellent presence and depth, without any noise whatsoever. Other shorts have synthesized orchestral scores that don't sound quite as good (but have more of a surround presence), but are still decent quality. The music is much more traditional than is found on the Kino disc. Out West intriguingly uses a soundtrack of period recordings, largely cleaned up and sounding quite nice indeed, and it fits extraordinarily well. The Garage features a score by Robert Israel on the Fotoplayer, a one-man-band type piano/organ that is amusing in its own right. The Brand recordings would rate a solid A; the others about B to B+. Extras Review: The sole extra is a set of production notes by Jeffrey Vance, who recently collaborated with Keaton's widow on a biography of the comedian. The notes are ample for most readers in giving the background of the period. The first eight films are on a dual-layer disc; the other four are on a single layer disc. Only one chapter to each 20+ minute short, though, and no 'play all' option. What's up with that? The Best? Well, in many respects, it is, though completists will still want Volume One of the Kino set for a more complete Moonshine and a better print of The Butcher Boy. But on the whole, this is the best place to start, and the two-disc set lists for less than either volume of the Kino set, which will certainly make it the first choice of fans of silent film who are on a budget.